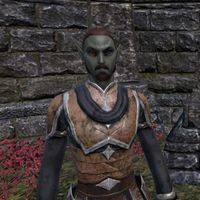 Aeren is a Dunmer member of the Mages Guild found in the guildhall of Mournhold. If spoken to, he will complain about fellow guild member Bakkhara. Occasionally, he will approach Xal-Geh to engage in conversation. Again, he will complain about Bakkhara to Xal-Geh. "Stupid Khajiit! It's no wonder we made slaves of them. Bakkhara is going to waste her gifts creeping around Valenwood." This page was last modified on 20 March 2019, at 03:00.